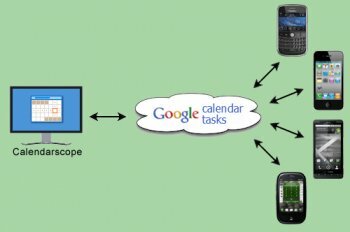 HandySync for Google allows you to synchronize Calendarscope data between your desktop computer and your Google Calendar and Google Tasks. The software allows you to extend synchronization to mobile devices supported by Google (Android, Apple iPhone, iPad, iPod touch, RIM Blackberry, Windows Phone, Palm Pre, Pixi, etc. ).